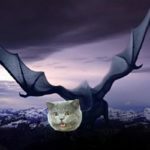 With the recent release of the new Hobbit movie, The Desolation of Smaug, a lot of people have been talking about the pronunciation of the titular dragon’s name. The inclination for English speakers is to pronounce it like smog, but Tolkien made clear in his appendixes to The Lord of the Rings that the combination au was pronounced /au/ (“ow”), as it is in German. A quick search on Twitter shows that a lot of people are perplexed or annoyed by the pronunciation, with some even declaring that they refuse to see the movie because of it. Movie critic Eric D. Snider joked, “I’m calling him ‘Smeowg’ now. Someone please Photoshop him to reflect the change, thanks.” I happily obliged. So what is it about the pronunciation of Smaug that makes people so crazy? Simply put, it doesn’t fit modern English phonology. Phonology is the pattern of sounds in language (or the study of those patterns), including things like syllable structure, word stress, and permissible sound combinations. In my undergraduate phonology class, my professor once gave us an exercise: think of all the consonants that can follow /au/, and give an example of each. The first several came easily, but we started to run out quickly: out, house (both as a noun with /s/ and as a verb with /z/), owl, mouth (both as a noun with /θ/ and as a verb with /ð/), down, couch, hour, and gouge. What these sounds all have in common is that they’re coronal consonants, or those made with the front of the tongue. And this isn’t simply a case like orange or silver, where nothing happens to rhyme with them. Through the accidents of history, the /aug/ combination simply does not occur in modern English. Before the Great Vowel Shift, Middle English /au/ turned into /ɔ:/ (as in caught today). (Note: the : symbol here denotes that a vowel is long.) During the Great Vowel Shift, /u:/ turned into a new /au/, but apparently this /u:/ never occurred before non-coronal consonants. This means that in Middle English, either /u/ lengthened before coronals or /u:/ shortened before non-coronals; I’m not sure which. But either way, it left us with the unusual pattern we see in English today. What all this technical gibberish means is that, in the absence of a clear pronunciation guide, readers will assume that the “au” in Smaug is pronounced as it is in other English words, which today is almost always /ɔ:/ or /ɑ:/. Thus most Americans will rhyme it with smog. (I can’t speak with authority about other varieties of English, but they would probably opt for one of those vowels or something similar, but not the diphthong /au/.) It’s not surprising that many readers will feel annoyed when told that their pronunciation clashes with the official pronunciation, which they find unintuitive and, frankly, rather non-English. One final note: Michael Martinez suggests in this post that /smaug/ is not actually Tolkien’s intended pronunciation. After all, he says, the appendixes are a guide to the pronunciation of Elvish, and Smaug’s name is not Elvish. Martinez quotes one of Tolkien’s letters regarding the origin of the name: “The dragon bears as name—a pseudonym—the past tense of the primitive Germanic verb Smugan, to squeeze through a hole: a low philological jest.” He seems to take this as evidence against the pronunciation /smaug/, but this is probably because Tolkien was not as clear as he could have been. 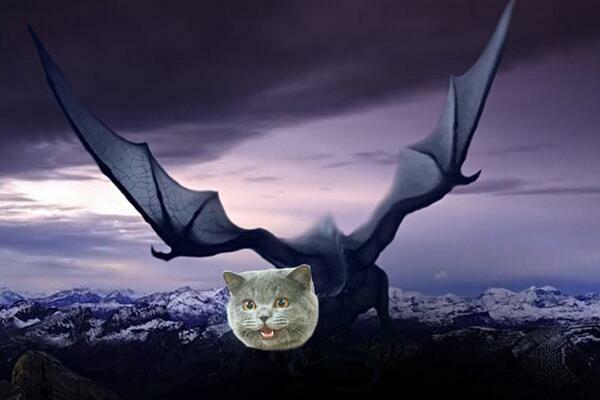 Smugan is the infinitive form; the past tense is—surprise—smaug. Note: the definition given for the Proto-Germanic form doesn’t quite match Tolkien’s, though it appears to be the same verb; the Old English form, also with the infinitive smugan, is defined as “to creep, crawl, move gradually”. The astute student of language will notice that the past tense of the verb in Old English had the form smēag in the first and third person. This is because the Proto-Germanic /au/ became /ēa/ in Old English and /i:/ or /ai/ in modern English; compare the German auge ‘eye’ and the English eye. This demonstrates once again that English lost the combination /aug/ quite some time ago while its sister languages hung on to it. So yes, it appears that Tolkien really did intend Smaug to be pronounced /smaug/, with that very un-English (but very Germanic) /aug/ combination at the end. He was a linguist and studied several languages in depth, particularly old Germanic languages such as Old English, Old Norse, and Gothic. He was certainly well aware of the pronunciation of the word, even if he didn’t make it clear to his readers. You can find the pronunciation silly if you want, you can hate it, and you can even threaten to boycott the movie, but you can’t call it wrong. This inclination is likely to be restricted to those with the cot-caught merger. Unfortunately, I can’t think of any word ending in the the THOUGHT vowel + g.
“the infinitive is—surprise—smaug.” Don’t you mean the indicative is smaug? And shouldn’t the “sauna” debate be in here somewhere? Thanks for a really interesting post. I was a bit of a Tolkien geek in my teens, poring over the appendices to The Lord of the Rings and The Silmarillion make sure I pronounced things right. But I learned how to pronounce the names in The Hobbit when my father read it to me in his estuary accent. So I learnt to pronounce it sm??g. And, in the the company of my more cockney friends, I might even add that bit of extra w before the g.
Really good post – very interesting! On the Scottish howf, the vowel sound would normally be pronounced /?u/ (reflecting the usual correspondence between Standard English /au/ and Standard Scottish English /?u/). I can think of one other Scottish word where /f/ follows /?u/, and that’s (the very slang) bowfin’, meaning disgusting or horrible. For what it’s worth, my natural temptation would be not to pronounce Smaug /sm?ug/. dw: Unfortunately, I have the cot–caught merger myself, so I have a hard time telling the difference. Do words like fog and dog not have the same vowel as thought in dialects that don’t have the merger? Jan: I actually meant the past tense (though it is the indicative past). Thanks for catching that, and thanks for the reminder about sauna. At least that /au/ is followed by a coronal consonant, so it’s not quite as foreign-sounding to English speakers. Craig: Unfortunately, my blog is having problems with special characters lately, so I’m not sure what symbol that was supposed to be. Based on this page, I’m guessing it’s a turned v. But I’d guess that the diphthong still has the same constraints as in other standard varieties of English, but with those exceptions. Ah. Caught out by the special characters. So, to clarify, my dad read me a story with a dragon called Smorg. And just as I often turn small into smaw, many people I know call him Smawg. For the record, all I was arguing against was using the guide to pronunciation in the appendices as a guide to pronouncing anything other than Elvish. I accept your reasoning although I cannot make heads or tails of all the funky characters. Nonetheless, as I said my article, I will not attempt to correct a lifetime of mispronunciation at this late stage. I’m afraid I will always say ‘smOg’. I hope people are okay with that. Thank you for the reference AND the explanation. There are so many other problems one could complain about in these movies based loosely on the novel by Tolkien. Smaug/smog. Who cares when Jackson ruined the movie by rewriting the book? Michael Martinez: Thanks for your response, and I’m sorry if I came across too harsh. I probably didn’t make it clear enough that I agree that the pronunciation guide for Elvish should not be taken as a pronunciation guide for anything other than Elvish. Smaug’s name just happens to be pronounced the same way, but for different reasons. And I certainly won’t judge or think less of anyone who sticks to the “smog” pronunciation. It feels much more natural to English speakers, and it’s hard to correct a lifetime of saying it that way. And therefore a very fitting source for the pseudo-Old English name of a different character, Sméagol. Of course! Thanks for pointing out an important connection that I completely forgot about. Actually, there are plenty of words that have the THOUGHT-vowel (without the cot-caught merger) followed by G, like “augmentation” or “forgo” (assuming R cannot appear in coda position). However, many of these words have their G in the onset. Notice that each of them would be excluded if R was allowed in coda position. My wife (who teaches German, French, and Spanish) believes that the sound should be voiced as “ow”, as in “ouch” (for the modern German), although she adds that there is no direct translation for the word “Smugan” in modern Germanic (at least none of which she is aware), and says that Smugan would probably sound more like ‘Schmiegen’. Also, in Appendix A, section III, of The Return of the King under “Durin’s Folk”, the name ‘Smaug’ is noted, but when we take into account the words of letter #144, then, it is likely that the name Smaug, like the Dwarven names, is also Scandinavian in character. This would mean that I’m more inclined to be of the belief of thinking them Icelandic. I also checked here: http://en.wiktionary.org/wiki/smugan#Old_English and (although I don’t know it’s accuracy) this shows Smugan as an Old English word, derived from the Proto-Germaic words sm?gan? or smeugan?. Since sm?gan? does not have any information shown, when we look at the word ‘smeugan?’ we see that it is a Proto-Germanic word, and it’s pronounced more like ‘Smew-gan’ (note, too, the German as my wife stated, as ‘Schmiegen’). Still, looking further down the page we see the Old Norse: smjúga. And if we click the link on smjúga, we find that it is indeed Icelandic. Also note on that page: smjúga strong verb (third person singular past indicative SMAUG, third person plural past indicative smugu, supine smogið). I had an earlier post which went into the explanation of the etymology of Smaug’s name. However, like Angel, I have also called the dragon by the condition of polluted air. The term smog, a contraction of smoke and fog, was introduced in 1905 by Dr. H.A. des Vœux to describe the mixture of soot, sulfuric acid, and other pollutants in emissions from coal furnaces in London, therefore Tolkien would have heard this expression used. Although the Hobbit was written much earlier, in 1952 London there occurred a significant air-pollution event called “The Great Smog”. Again, I understand that the Hobbit was written prior to this particular event. However, as I noted earlier, smog was a problem in London and other industrial cities. An article in the 1871 New York Times mentions “London, particularly, where the population are periodically submerged in a fog of the consistency of pea soup…” The Great Smog was not thought at first to be significant, as London had many smog events in the past, referred to as “pea soupers”. The city has been affected by smog since the times of King Edward I (1272-1307), who was the first to try to forbid the use of coal in London. Such fogs were prevalent in UK cities, especially in London where the smoke from millions of chimneys combined with the mists and fogs of the Thames valley. The result was commonly known as a London particular or London fog, which then, in a reversal of the idiom, became the name for a thick pea and ham soup. Tolkien was obviously aware of these deadly fogs, but he also had a sense of humor; and with a play on words, the dragon Smaug was created. Therefore, when taking into account the information from my previous post concerning the Icelandic, and with the knowledge of these deadly air conditions, I’m of the persuasion that Smaug is pronounced “Smog”, and NOT “Smowg”. If we read Tolkiens words in letter #25, he said that Smaug was a psuedonym of the past tense of the primitive Germanic verb Smugan. However that is really the Old English. The Proto-Germanic form was smeugan?. Descendant languages included Old English and Old Norse. Sm?gan(OE) means to creep, crawl, move gradually, while smjúga(ON) also means to creep, though through an entrance. My point here is to show that perhaps Tolkien should not have used the word sm?gan in his letter, but smeugan? instead. Still, if we look at the ON, the word smjúga is Icelandic. So the question is, how do we pronounce the Icelandic word, smjúga? Well, unfortunately I do not speak it myself so I had to do some research online. I found this site: http://www.101languages.net/icelandic/diphthongs.html Here they show the au dipthong pronounced as oh-ee. Thence the Icelandic pronounciation of Smaug would appear to sound like smoy-g. Unfortunately I could not include a second weblink in the previous post, as it kept reading it as possible spam. So here is a second Icelandic dipthong pronounciation website: http://www.studymode.com/essays/Learn-Icelandic-In-10-Minutes-1649930.html(au diphthong starting as ö and ending with a y-sound, similar to the French feuille). Even, it seems, for certain translated names. If I am correct Tolkien’s ‘au (aw) as in loud’ in the Elvish section works for Smaug, even though this name is arguably a translation given its Primary World derivation, and certainly so in draft texts, given that the Dragon’s ‘real’ name is there said to be Trâgu. Not every example will work: Gandalf doesn’t for instance, as it would be ‘Gandalv’ according to the Elvish section, but one could consider this example Anglicized perhaps, since we hear Tolkien himself pronounce final -f.
Anyway that’s what I think -so far- although I’m no linguist myself. Thanks, Galin. It seems pretty clear that the pronunciation guide for Elvish would apply to Smaug’s name too. I suppose I should have read the appendixes a little more thoroughly first.